For the Birds - Aquascape, Inc. In winter, water can be hard for birds to find, especially during long spells without snow. When forced to eat snow for their moisture, their body must work to warm it up. And when the sun is out, you will see birds hopping from rock to rock in search of melting ice near the water’s edge. All of this takes valuable energy. 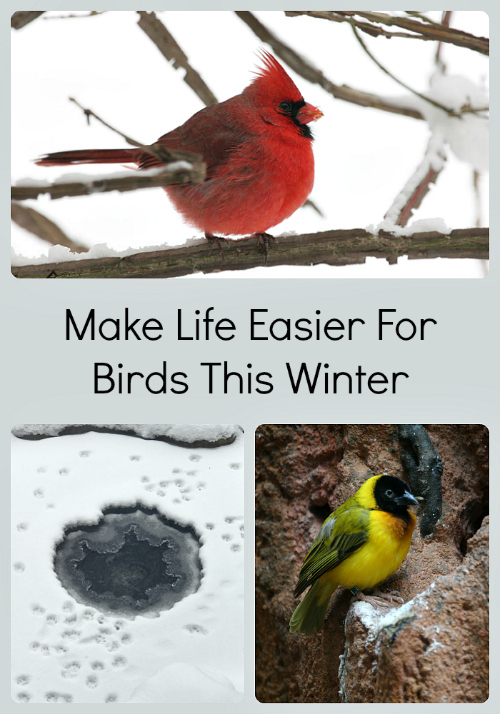 You can make life easier in the winter by leaving open water in your pond in a place that is easily accessible to the birds. You can do this with a pump that moves the water, preventing it from freezing, or with a pond aerator. Don’t forget to feed the birds who come to visit your pond. As with water, it is sometimes hard for them to find enough food during the winter. In addition to store-bought bird feed and suet, include native trees and shrubs in your landscape that offer edible fruit for the birds.